(Nanowerk News) A new generation of miniature biological robots is flexing its muscle. 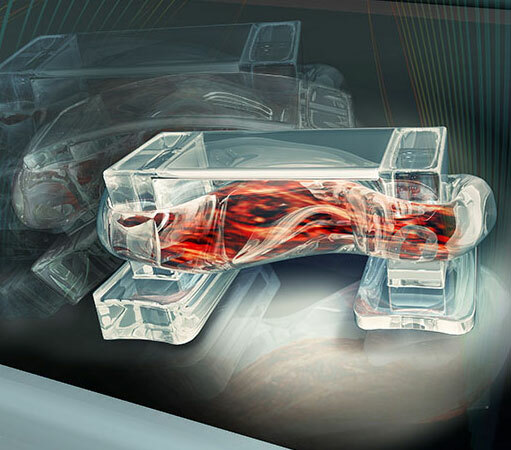 Engineers at the University of Illinois at Urbana-Champaign demonstrated a class of walking “bio-bots” powered by muscle cells and controlled with electrical pulses, giving researchers unprecedented command over their function. The group published its work in the online early edition of Proceedings of the National Academy of Science ("Three-dimensionally printed biological machines powered by skeletal muscle"). Bashir’s group has been a pioneer in designing and building bio-bots, less than a centimeter in size, made of a flexible 3-D printed hydrogels and living cells. Previously, the group demonstrated bio-bots that “walk” on their own, powered by beating heart cells from rats. However, heart cells constantly contract, denying researchers control over the bot’s motion. This makes it difficult to use heart cells to engineer a bio-bot that can be turned on and off, sped up or slowed down. The design is inspired by the muscle-tendon-bone complex found in nature. There is a backbone of 3D printed hydrogel, strong enough to give the bio-bot structure but flexible enough to bend like a joint. Two posts serve to anchor a strip of muscle to the backbone, like tendons attach muscle to bone, but the posts also act as feet for the bio-bot. A bot’s speed can be controlled by adjusting the frequency of the electric pulses. A higher frequency causes the muscle to contract faster, thus speeding up the bio-bot’s progress as seen this video. “The goal of 'building with biology' is not a new one - tissue engineering researchers have been working for many years to reverse engineer native tissue and organs, and this is very promising for medical applications,” said graduate student Ritu Raman, co-first author of the paper. “But why stop there? We can go beyond this by using the dynamic abilities of cells to self-organize and respond to environmental cues to forward engineer non-natural biological machines and systems.